Black Imprint on Color Check designed to fit ADAM Systems P/R format. Size is 8-1/2" x 11". 24# Security Bond Paper. Available in 5 Colors - Dark Blue, Green, Burgundy, Purple and Brown. Some of the Security Features include: Void Pantograph, Padlock Icon, Check Warning Border, Security Back Printing, Thermochronic Icon, Ghost Watermark Backer and Chemical Reactivity. 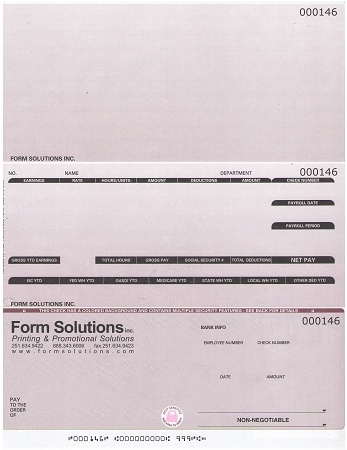 Voided Check will need to be faxed to 251-634-9423 or scanned and emailed to charles@formsolutions.com for Bank Information. Packaged 250 per pack.